"Alba" (English: /ˈælbə/) is the Scottish Gaelic name (pronounced [ˈal̪ˠapə]) for Scotland. It is cognate with the Irish term Alba (gen. Albann, dat. Albainn) and the Manx term Nalbin, the two other Goidelic Insular Celtic languages, as well as contemporary words used in Cornish (Alban) and Welsh (Yr Alban), both of which are Brythonic Insular Celtic languages. (The third surviving Brythonic language, Breton, instead uses Bro-Skos, meaning 'country of the Scots'.) In the past these terms were names for Great Britain as a whole, related to the Brythonic name Albion. The term first appears in classical texts as Ἀλβίων Albíon or Ἀλουΐων Alouíon (in Ptolemy's writings in Greek), and later as Albion in Latin documents. Historically, the term refers to Britain as a whole and is ultimately based on the Indo-European root for "white". 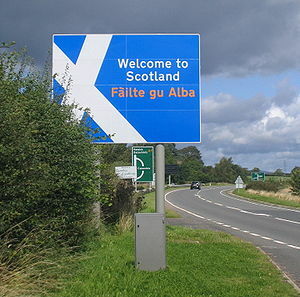 It later came to be used by Gaelic speakers in the form of Alba (dative Albainn, genitive Albann, now obsolete) as the name given to the former kingdom of the Picts which when first used in this sense (around the time of king Causantín mac Áeda (Constantine II, 943–952)) had expanded. The region Breadalbane (Bràghad Albann, the upper part of "Alba") takes its name from it as well. The Pictish, and later Scottish, Kings were crowned at the seat on Moot Hill Scone. It was this stone which was taken to Westminster Abbey and used in Coronations for the monarchs of the United Kingdom. As time passed that kingdom incorporated others to the southern territories. It became re-Latinized in the High Medieval period as "Albania" (it is unclear whether it may ultimately share the same etymon as the modern Albania). This latter word was employed mainly by Celto-Latin writers, and most famously by Geoffrey of Monmouth. It was this word which passed into Middle English as Albany, although very rarely was this used for the Kingdom of Scotland, but rather for the notional Duchy of Albany. It is from the latter that Albany, the capital of the US state of New York, and Albany, Western Australia take their names. Belgian Michel Roger Lafosse, who claims the Scottish throne, has styled himself as "HRH Prince Michael James Alexander Stewart, 7th Count of Albany" since 1978. BBC Alba, a television channel broadcasting mainly in Scottish Gaelic, was launched in September 2008 as a joint venture between MG Alba and the BBC. A new version of Runrig's song Alba (originally on their album, The Cutter and the Clan) was featured on the channel's launch. In the mid-1990s, the Celtic League started a campaign to have the word "Alba" on the Scottish football and rugby tops. Since 2005, the SFA have supported the use of Scottish Gaelic by adding Alba on the back of the official team strip. However, the SRU is still being lobbied to have Alba added to the national rugby union strip. In 2007, the then Scottish Executive re-branded itself as "The Scottish Government" and started to use a bilingual logo with the Gaelic name Riaghaltas na h-Alba. However, the Gaelic version from the outset had always been Riaghaltas na h-Alba. The Scottish Parliament, likewise, uses the Gaelic name Pàrlamaid na h-Alba. ^ "Gaelic added to Scotland strips". BBC News. 24 August 2006. Retrieved 2010-01-01. ^ "Gàidhlig air lèintean rugbaidh na h-Alba". BBC Scotland Alba. 24 June 2008.